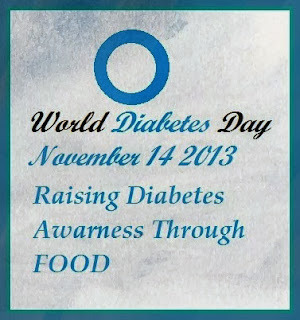 World Diabetes Day, on the 14th November every year, has grown from humble beginnings to become a globally-celebrated event to increase awareness about diabetes. Thanks to swathi Iyer for sending details about it. Diabetes mellitus, or simply diabetes, is a group of metabolic diseases in which a person has high blood sugar, either because the pancreas does not produce enough insulin, or because cells do not respond to the insulin that is produced.Awareness is most common fact to reduce or e free from this chronic disease. There are a couple of things to take into account.Try to avoid sugar as far as possible or any sugary edibles.Try a low carb diet and last but not least having a high protein fibre diet. So today's post is related to it. Banana stem is a rich source of fibre . Its high fibre content creates a feeling of satiation and hence, reduces the intake of food. It also helps ease constipation. Banana stem is rich in potassium and vitamin B6 just like the fruit. Vitamin B6 helps in production of haemoglobin and insulin. Deskin the banana stem & chop it. Take a bowl add 3 cups of water & add little buttermilk or yohurt. Add the chopped banana stem in buttermilk mix and soak. It avoids discolouring in banana stem. Strain the banana stem & add to a bowl. Add soaked & strained Moong dal , grated coconut. Heat oil in a pan, add mustard seed, curry leaves & allow to temper & add to the salad. Squeeze the lemon juice & mix well. பொதுவாக வாழைத்தண்டில் கறியோ அல்லது காரசாரமான மோர்க்கூட்டோ தான் செய்வோம். அதை கோசுமல்லியாகவும் செய்யலாம் என்பது புதுமையாகவும் அருமையாகவும் உள்ளது. நார் சத்து நிரம்பிய வாழைத்தண்டு சர்க்கரை நோயாளிக்களுக்கு மிகச்சிறந்த உணவுப்பொருள் என இங்கு முடிச்சுப்போட்டுள்ளது, இன்றைய தினத்திற்கு ஏற்ற பொருத்தமான விஷயம் தான். Thanks sripriya for joining me in creating awareness on this world diabetes day. Delicious banana stem salad yum. Thanks Sripriya for joining in creating awareness for diabetes on this world diabetes day. 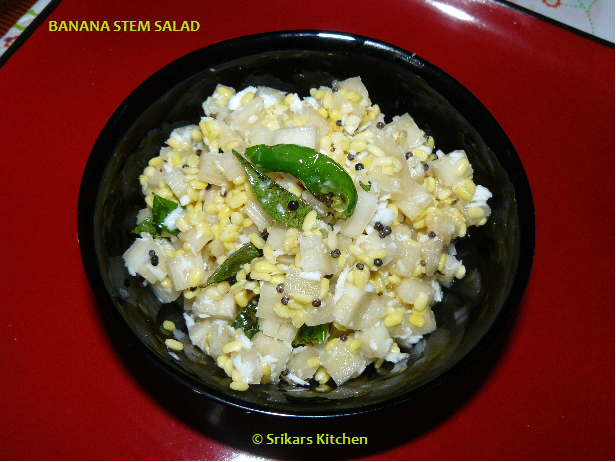 Banana stem salad looks delicious. wow very healthy dish I have never made it since I dont get it here so nice to see it online htough. wow so healthy and very yummy. I don't get it here so I don't make it nice to see it online. Sounds interesting.. thanks for sharing! !